Fee's Little Craft Studio: It's Finished !!!!!! My project from the Christmas Gathering is now finished and mounted on canvas. 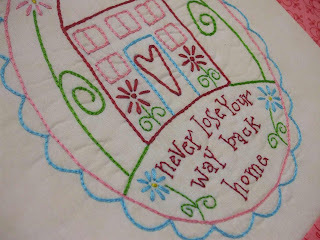 I really enjoyed this stitchery and it is in colours that I do not normally use together. I framed it with some fabric from Rosalie's new range. Have you seen it yet? It is really lovely. Tomorrow is Melbourne Cup Day - Good Luck to anyone having a little flutter. Sentiments of Home. Very nice. Beautifully done! Such a sweet sentiment. I love it! It's stunning. Wow! You were quick. It looks great ... still plodding through mine! Fiona, that looks wonderful! I really love the colors you used. How did you mount it on canvas? Just with glue? Your work is beautiful and the colours are bright and cheery. Good to have a finish ready to display. Enjoy. Very, very beautiful and colorful...I love it! Looks fabulous, you did a great job putting it on the canvas! I must get to Chickenfeed today and pick one or two up! P.S. Hope you have a fun day with all those guests! Oh I love that Fee Fee ... love the sentiment :o). Those aren't colours I would normally use together either but they look gorgeous!!!! Hope you win on the Cup!!!!!!!!! Sweetie, that is *seriously* gorgeous!!! 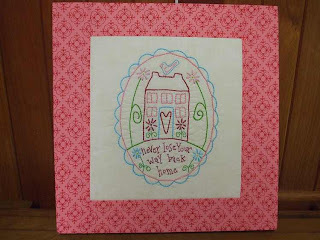 Your stitchery is just lovely and I really like the idea of mounting it on canvas just for something different. I Fiona, this morning I sent my Advent swap box to Kim. I hope It will arrive soon! Do you want the handmade big gift's photo? That is really terrific! I love the colors and the design but the colors you chose really make it! Looks gorgeous Fiona , lovely colours . it's gorgeous Fiona, and I love the pink border! WOW! Fiona, it looks fantastic! Well done! I am like Christine - still plodding along! Just lovely, well done, great that you had such a wonderful time at the gathering.